Arthur Edwin Lawrence was born in Saul on 9 November 1893, one of the seven children of Edwin Charles Lawrence (a master mariner) and Jane Walkley, and the younger brother of Victor Charles. The family's home was one of the cottages at Tobacco Box, now part of Frampton parish. By 1911 Arthur was working as a bricklayer, but he joined Cadbury's in 1916 where he started work at 6am to light the fires on the Sentinel steam wagons. Little is known about Arthur's service during the war but it is commemorated on the plaque in Frampton Village Hall. 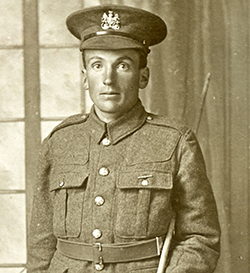 Family recall him working on a farm in Dorset during 1918-19, which accords with the evidence of this photograph of him in uniform : the cap badge suggests that he served in the Volunteer Force, which served only in Britain, rather than in the Regular Army. From the outset of the war, groups of volunteers had established companies for local defence. The 1916 re-statement of the Volunteer Act of 1863 passed control of these units to the county Territorial Associations, whereupon they became volunteer regiments. In 1918 county Volunteer Regiments became Volunteer Battalions of line regiments, but the history is generally vague. After the war, Arthur returned to Cadbury's and was employed as a greaser until transferring to the churn repair shop in 1953. He retired five years later. During that time he had umpired local cricket matches and acted as a football linesman; latterly he was also a very enthusiastic member of the factory bowls club. On 16 September 1925, Arthur married Maud Berry at St Mary's, Frampton and they had three children, Sam, Ray and Rita. Arthur Edwin Lawrence died in Stroud Hospital in August 1971 and was cremated at Gloucester Crematorium, his commemorative plaque later being transferred to Dursley Crematorium.